Norwich Airport is celebrating a 10% increase in passenger numbers, passing the half a million mark for the first time since 2008. Figures just released by the CAA show that Norwich handled 506,007 passengers in 2016, up 43,343 on the year before, an increase of 10%. The growth is being attributed to the launch of several new routes in 2016 including the return of year-round sunshine flights to Malaga and Alicante last Easter, the first in almost 10 years. 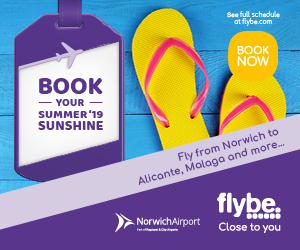 The flights were made possible by an innovative partnership between Exeter-based airline Flybe and Regional & City Airports (RCA), the airport management division of Rigby Group PLC, which owns Norwich Airport and Exeter Airport. This saw the introduction of one of Flybe’s E195 118-seater jet aircraft on the routes, which operate year-round. The addition of winter ski flights to Chambery, a year-round service to Exeter and holiday flights to Gran Canaria and Cyprus have also played their part. Norwich Airport managing director Richard Pace said: “We’ve had a great year and every month saw passenger growth of between 4% and 19%. Richard said that he was hopeful of continued growth in 2017 with the launch of a new weekly service to the Greek Island of Rhodes, increased flights to Jersey, and special flights to Dubrovnik in Croatia and Venice in Italy.